W x L x H: 24" x 40" x 38.5"
Feature: Grinds to within 1/4" of a vertical surface. Fearure: Has vacuum hose port for dust collection. Note: Unit requires a 20-Amp Circuit. 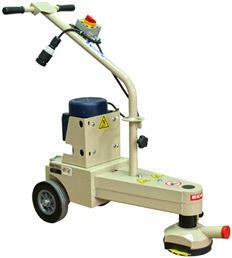 * Please call us with any questions about our grinder concrete 7 inch turbo electric rentals in Aberdeen OH, Maysville KY, Manchester, Georgetown, West Union and the Cincinnati Metro Area.